Kenton Thomas, 32, was arraigned today on a murder charge for the June 1 fatal stabbing of Jocelin Nordeus on River Street in Mattapan Square, the Suffolk County District Attorney's office reports. Dorchester Municipal Court Judge Jonathan Tynes ordered Thomas held without bail, the DA's office reports. Boston Police say they're determined to end problems by daytime drinkers congregating outside Mattapan Square liquor stores downing the nips and single cans of beer they've just bought, and are now about a month into a crackdown that they say so far is working. Read more. Daniel Bunch's family says there were plenty of witnesses to his fatal shooting at the Mobil gas station on Blue Hill Avenue at Babson Street on Oct. 8, 2011. Now they're hoping that a $10,000 reward will get somebody to talk to investigators and lead them to his murderer. Anybody with information can contact the BPD tip line by calling 1-800-494-TIPS (8477) or texting TIP to CRIME (27463). Three masked men with a gun who have robbed five stores in Hyde Park, Roslindale and Roxbury robbed two more stores on Blue Hill Avenue in Mattapan, Boston Police report. Read more. 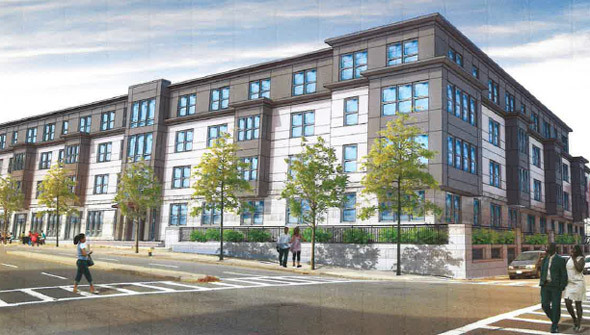 Preservation of Affordable Housing and Nuestra Comunidad Development Corp. recently filed detailed plans for their 135-unit apartment building on what is now a parking lot next to the Mattapan trolley station. Read more. Architect's rendering, featuring token black person. 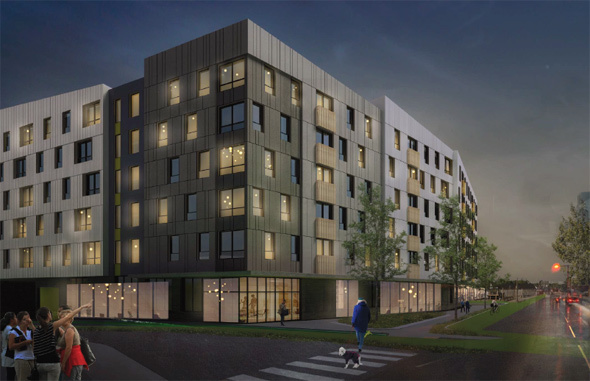 Developers this week signaled their formal intent to replace a parking lot next to the Mattapan Square trolley station with a two-building, 144-unit mixed-income development. Read more. J'Cynda Sales, a teller at the Citizens Bank branch on Blue Hill Avenue in Mattapan Square, admitted yesterday that she drained a customer's account of the money over a six-month period, the US Attorney's office reports. Read more. Boston Police report arresting Saquan Gorman, 25, and Esau Gorman, 22, Friday afternoon at a Mattapan Square residence on charges of possession of crack with intent to distribute. Read more. Architect's rendering of the view from near Mattapan Square. The MBTA board today officially designated a pair of non-profit groups to build 135 residential units - 69 marketed as affordable - on what is now an underused parking lot for the trolley station in Mattapan Square. Read more. WCVB reports on a video taken by a customer of the America's Food Basket in Mattapan Square. 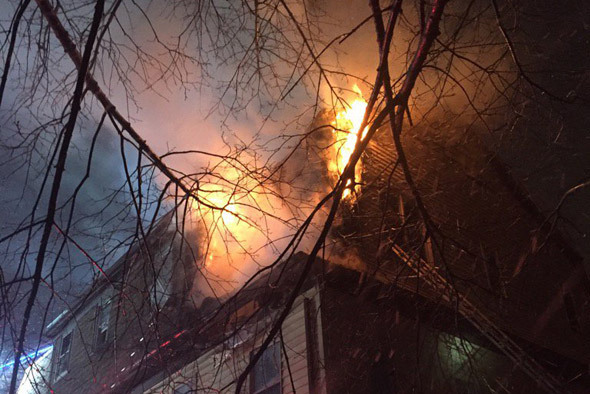 Around 8 p.m. on Thursday on Blue Hill Avenue near Rexford Street, WFXT reports. Boston Police report arresting two men they say used a SpongeBob SquarePants backpack to store the cocaine they were selling out of a car in Mattapan Square yesterday afternoon. Read more. A Hyde Park man is charged with shooting a man over an argument he initially had nothing to do with inside the T-Mobile store on Blue Hill Avenue in Mattapan Square yesterday afternoon, the Suffolk County District Attorney's office reports. Read more. The Herald reports two groups submitted bids for an MBTA-owned parcel next to the Mattapan Line station in Mattapan Square. Both are looking at apartments and retail for the 2.5-acre parcel. A third-floor fire reported around 6:25 p.m. at 849 Cummins Highway went to two alarms not long after. Read more. The Planning Office for Urban Affairs and Caribbean Integration Community Development say the proposed Cote Village, next to the planned Cummins Highway stop on the Fairmount Line, would remove a neighborhood blight and provide much needed affordable housing in a transit-oriented development. Read more.